Tuff Country traction bars help to reduce axle hop or wrap, providing increased traction and acceleration for vehicle with larger than stock tires. Designed to mount one end to the ubolt plate and the other to the vehicle's frame. 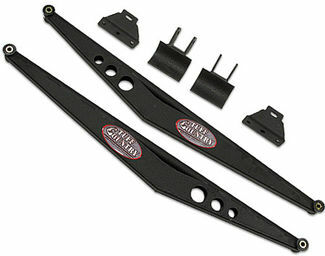 The standard traction bars by Tuff Country are made to increase the traction and the acceleration of your vehicle. They reduce axle/spring wrap that are associated with bigger tires. The bar is powder coated for durability. It designed to mount one end to the U-bolt plate and the the vehicles frame. The Tuff Country performance traction bar will give your vehicle better traction and acceleration. It longer than normal length makes this bar ideal with vehicles that have a high horsepower, towing applications and lifted trucks. It comes with greasable and re-buildable heim joints. Polyurethane bushings are included. 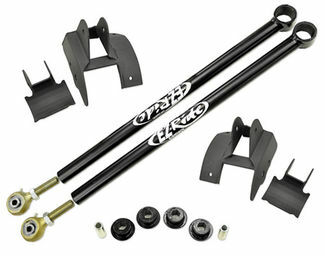 It has an adjustable length and will fit both stock and lifted Doge Ram 2500 and 3500 trucks. Powder coated for durability and requires no welding to install. Tuff Country's Ladder Bars are made to give your truck better handling and a better overall performance. Designed to reduce the vehicles axle hop and the rear leaf spring spring wrap. (which can really harm your vehicle, and also diminish its resale value) They will increase your trucks acceleration and traction as it will keep tire contact with roads at all times to increase its performance anywhere you go. The ladder bars are heavy duty and built to last, powder coated for longer last and durability. They are made from 1 1/4 inch steel tube and made in the USA. Include everything required for mounting and installing this product on your vehicle in around 2 to 3 hours.